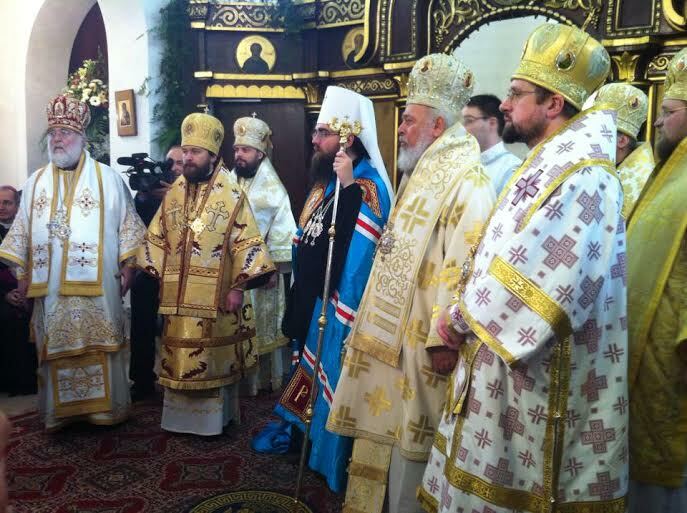 His Eminence, Archbishop Benjamin of San Francisco and the West and Archimandrite Alexander [Pihach], Dean of the Orthodox Church in America’s Saint Catherine Representation Church, Moscow, concelebrated at the enthronement of His Beatitude, Metropolitan Rastislav of the Czech Lands and Slovakia on February 9, 2014. Metropolitan Rastislav was elected at the 13th General Assembly of the Church of the Czech Lands and Slovakia on January 11, 2014. The enthronement took place at Saint Alexander Nevsky Cathedral, Prešov, Slovakia. Delegations from the Churches of Antioch, Russia, Poland and Ukraine also were present. The Orthodox Church in America and the Church of the Czech Lands and Slovakia have long-lasting and deep spiritual and historical connections. At the end of the 19th century immigrants from the Carpathian region, then under the rule of the Austro-Hungarian Empire, came to the United States seeking work and a better life. These immigrants were ancestors of many of the faithful of the Orthodox Church in America. Among these immigrants was Father Alexis Toth, now a saint canonized by the Orthodox Church in America. Saint Alexis became a missionary priest in America, leading many to the Orthodox faith of their ancestors. Today our Churches, each in its own place and society, continue to witness to the Orthodox faith. Our Churches are minority churches in our societies. This places on us a common responsibility to be steadfast in the confession of the Orthodox faith while being open to all, available for dialogue in which we “give an account of the hope that is in us with meekness and reverence” (1 Peter:3:15), welcoming in the name of Christ any who come to us. In the Orthodox Church in America many among our bishops, priests, monastics, and lay people are converts to the Orthodox faith. This is a natural outcome of life in a pluralistic society in which we are a minority. Both of our Churches have many reasons to thank God for the numerous blessings bestowed on us. Our Churches have also suffered difficulties which can at times seem insurmountable. This encourages us to turn to God, asking for the grace and wisdom and patience we need in order “rightly to divide the word of God’s truth” (Liturgy of St. John Chrysostom). Your Beatitude: On behalf of the hierarchs, clergy, monastics and faithful people of the Orthodox Church in America we convey to You, through His Eminence, Archbishop Benjamin of San Francisco and Archimandrite Alexander [Pihach], Dean of Saint Catherine’s Representation Church in Moscow, our love and congratulations. We pray fervently that Your ministry as Primate of the Church of the Czech Lands and Slovakia will bring about the “unity of the Spirit in the bond of peace” [Ephesians 4:3], both within Your Holy Church and in the fellowship of the entire Holy Orthodox Church.